For other uses, see Abner (disambiguation). In the Book of Samuel, Avner (Hebrew אֲבִינֵר ’Avnêr meaning "Father's Light"), was cousin to Saul and commander-in-chief of his army (1 Samuel 14:50, 20:25). He is often referred to as Avner Ben Ner, meaning, the son of Ner. Abner is only referred to incidentally in Saul's history (1 Samuel 14:50, 17:55, 26:5), first appearing as the son of Ner, Saul's uncle, and the commander of Saul's army. He then comes to the story again as the commander who introduced David to Saul following David's killing of Goliath. He is not mentioned in the account of the disastrous battle of Gilboa when Saul's power was crushed. Seizing the youngest but only surviving of Saul's sons, Ish-bosheth, Abner set him up as king over Israel at Mahanaim, east of the Jordan. David, who was accepted as king by Judah alone, was meanwhile reigning at Hebron, and for some time war was carried on between the two parties. The only engagement between the rival factions which is told at length is noteworthy, inasmuch as it was preceded by an encounter at Gibeon between twelve chosen men from each side, in which the whole twenty-four seem to have perished (2 Samuel 2:12). [lower-alpha 1] In the general engagement which followed, Abner was defeated and put to flight. He was closely pursued by Asahel, brother of Joab, who is said to have been "light of foot as a wild roe" (2 Samuel 2:18). As Asahel would not desist from the pursuit, though warned, Abner was compelled to slay him in self-defence. This originated a deadly feud between the leaders of the opposite parties, for Joab, as next of kin to Asahel, was by the law and custom of the country the avenger of his blood. However, according to Josephus, in Antiquities, Book 7, Chapter 1, Joab had forgiven Abner for the death of his brother, Asahel, the reason being that Abner had slain Asahel honorably in combat after he had first warned Asahel and had no other choice but to kill him out of self-defense. This battle was part of a civil war between David and Ish-bosheth, the son of Saul. After this battle Abner switched to the side of David and granted him control over the tribe of Benjamin. This act put Abner in David's favor. The real reason that Joab killed Abner was that he became a threat to his rank of general. He then justifies it later by mentioning his brother. For some time afterward the war was carried on, the advantage being invariably on the side of David. At length, Ish-bosheth lost the main prop of his tottering cause by accusing Abner of sleeping with Rizpah (cf. 2 Samuel 3:7), one of Saul's concubines, an alliance which, according to contemporary notions, would imply pretensions to the throne (cf. 2 Samuel 16:21ff.). 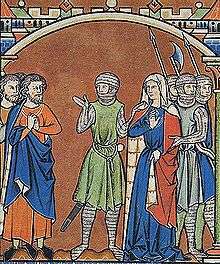 Abner was indignant at the rebuke, and immediately opened negotiations with David, who welcomed him on the condition that his wife Michal should be restored to him. This was done, and the proceedings were ratified by a feast. Almost immediately after, however, Joab, who had been sent away, perhaps intentionally returned and slew Abner at the gate of Hebron. The ostensible motive for the assassination was a desire to avenge Asahel, and this would be a sufficient justification for the deed according to the moral standard of the time. The conduct of David after the event was such as to show that he had no complicity in the act, though he could not venture to punish its perpetrators (2 Samuel 3:31-39; cf. 1 Kings 2:31ff.). David and the tomb of Abner. Artist unknown. 19th century. David had Abner buried in Hebron, as it states in 2 Samuel 3:31-32, "And David said to all the people who were with him, 'Rend your clothes and gird yourselves with sackcloth, and wail before Abner.' And King David went after the bier. And they buried Abner in Hebron, and the king raised his voice and wept on Abner's grave, and all the people wept." Soon after Abner's death, Ish-bosheth was assassinated as he slept (2 Samuel 4), and David became king of the reunited kingdoms (2 Samuel 5). The site known as the Tomb of Abner is located not far from the Cave of the Patriarchs in Hebron and receives visitors throughout the year. Many travelers have recorded visiting the tomb over the centuries. Benjamin of Tudela, who began his journeys in 1165, wrote in the journal, "The valley of Eshkhol is north of the mountain upon which Hebron stood, and the cave of Makhpela is east thereof. A bow-shot west of the cave is the sepulchre of Abner the son of Ner." A rabbi in the 12th century records visiting the tomb as reprinted in Elkan Nathan Adler's book Jewish Travellers in the Middle Ages: 19 Firsthand Accounts. The account states, "I, Jacob, the son of R. Nathaniel ha Cohen, journeyed with much difficulty, but God helped me to enter the Holy Land, and I saw the graves of our righteous Patriarchs in Hebron and the grave of Abner the son of Ner." Adler postulates that the visit must have occurred prior to Saladin's capture of Jerusalem in 1187. 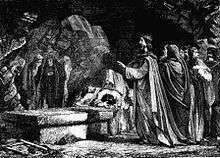 Rabbi Moses Basola records visiting the tomb in 1522. He states, "Abner's grave is in the middle of Hebron; the Muslims built a mosque over it." Another visitor in the 1500s states that "at the entrance to the market in Hebron, at the top of the hill against the wall, Abner ben Ner is buried, in a church, in a cave." This visit was recorded in Sefer Yihus ha-Tzaddiqim (Book of Genealogy of the Righteous), a collection of travelogues from 1561. Abraham Moshe Lunz reprinted the book in 1896. Over the years the tomb fell into disrepair and neglect. It was closed to the public in 1994. In 1996, a group of 12 Israeli women filed a petition with the Supreme Court requesting the government to reopen the Tomb of Abner. More requests were made over the years  and eventually arrangements were made to have the site open to the general public on ten days throughout the year corresponding to the ten days that the Isaac Hall of the Cave of the Patriarchs is open. In early 2007 new mezuzot were affixed to the entrance of the site. 1960, David and Goliath (film) - Abner portrayed by Massimo Serato. In this version, Abner tries to murder David (Ivica Pajer) when he returns in triumph after killing Goliath. However, Abner is slain by King Saul (Orson Welles). 1961, A Story of David (film) - Abner portrayed by Welsh actor David Davies. 1976, The Story of David (television series) - Younger version of Abner portrayed by Israeli actor Yehuda Efroni. Older version of Abner portrayed by British actor Brian Blessed. 1985, King David (film) - Abner portrayed by English actor John Castle. King David portrayed by Richard Gere. 1997, King David (musical) - written by Tim Rice and Alan Menken. Abner portrayed by American actor Timothy Shew. 1997, David (television drama) - Abner portrayed by Richard Ashcroft. 2009, Kings (television series) - Abner portrayed by Wes Studi as General Linus Abner. The series takes place in present-day United States with characters based on the Bible. 2012, Rei Davi (Brazilian television series) - Abner portrayed by Iran Malfitano. ↑ According to Chisholm (1911), [t]he object of the story of the encounter is to explain the name Helkath-hazzurim, the meaning of which is doubtful (Ency. Bib. col. 2006; Batten in Zeit. f. alt-test. Wissens. 1906, pp. 90 sqq.). 1 2 3 One or more of the preceding sentences incorporates text from a publication now in the public domain: Chisholm, Hugh, ed. (1911). "Abner". Encyclopædia Britannica. 1 (11th ed.). Cambridge University Press. p. 66. ↑ "Shmuel II - Chapter 3". www.chabad.org. Retrieved 2016-01-06. ↑ The Itinerary of Benjamin of Tudela: Travels in the Middle Ages. New York: NightinGale Resources. 2004-03-01. ISBN 9780911389098. ↑ Adler, Elkan Nathan, ed. (2011-11-30). Jewish Travellers in the Middle Ages: 19 Firsthand Accounts. New York: Dover Publications. ISBN 9780486253978. ↑ Avraham, David (1999-12-31). In Zion and Jerusalem: The Itinerary of Rabbi Moses Basola 1512-1523. Jerusalem: C G Gundation. ISBN 9789652229267. ↑ Ochser, Schulim. "URI (ORI) BEN SIMEON". History and Anthropology in Jewish Studies. Penn Libraries. Retrieved January 5, 2015. ↑ "The first Holy Land hotelier". The Jerusalem Post | JPost.com. Retrieved 2016-01-10. ↑ ""Book of the Occurrences of the Times to Jeshurun in the Land of Israel" by David G. Cook and Sol P. Cohen". repository.upenn.edu. Retrieved 2016-01-10. ↑ "Eight years in Asia and Africa from 1846-1855 : Israel Joseph Benjamin : Free Download & Streaming". Internet Archive. Retrieved 2016-01-10. ↑ Abrahams, Israel (2016-01-05). The Book of Delight and Other Papers. CreateSpace Independent Publishing Platform. ISBN 9781523233328. ↑ "Google Groups". groups.google.com. Retrieved 2016-01-06. ↑ "Articles by David Wilder: The Mystery of the Tomb of Avner ben Ner or Understanding Uzis Whims". davidwilder.blogspot.co.il. Retrieved 2016-01-06. Tomb of Abner page on Hebron.com website. David, Abraham (ed.) (1999). In Zion and Jerusalem: The Itinerary of Rabbi Moses Basola (1521–1523) C. G. Foundation Jerusalem Project Publications of the Martin (Szusz) Department of Land of Israel Studies of Bar-Ilan University ISBN 9652229261. Reference is made to visiting the tomb of Abner. (p. 77). Photo of prayer at the Tomb of Abner from Imagekind. 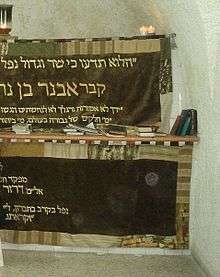 Photo of prayer at the Tomb of Abner from PicJew. Photos of Tomb of Abner Ben Ner from the book Sites in Hebron by David Wilder. ASIN: B00ALHB89Y.